Before we set off on our trip we did some extensive research on the internet, which is full of blogs and travel diaries like our one, some in Portuguese. It gave us a good idea on how many kilometres per day are achievable and how the road conditions are. It allowed us to plan the trip roughly. On this page we would like to pass on our thoughts and gathered info for those who would like to embark on a similar trip than us. One main question we had was the question of what car we are going to use and where we get if from. 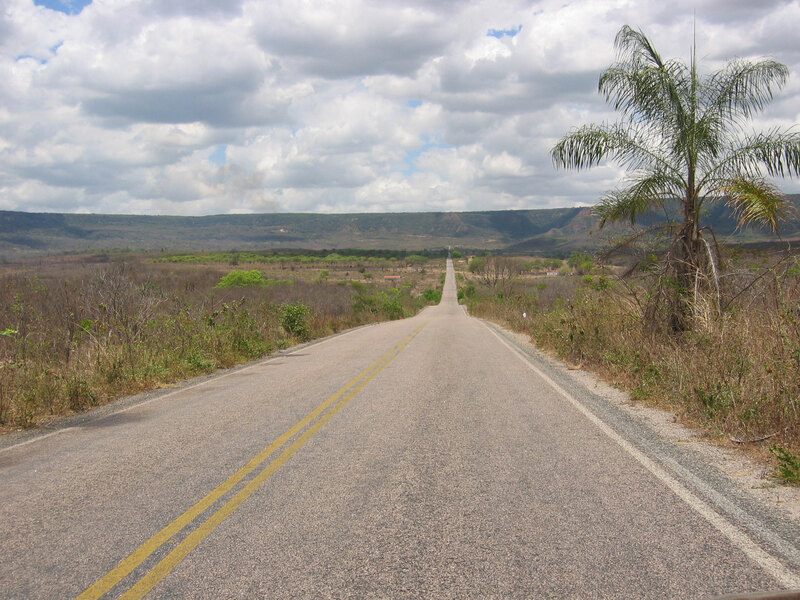 The trip would have been possible as well is a Fiat Uno as most of the roads were decent gravel roads or tarmac (taking the road towards Alto Paraíso de Goiás out of the equation – see day 12). However, we would have been more tired at the end of each day and we might have had more repairs especially of flat tyres driving through the potholes, especially but not only in Brazil. I Think the car we got was a good compromise although the open back, even tough covered, made our luggage considerably dusty on gravel roads and we could not lock your luggage away if we needed to leave the car somewhere unattended for a while. On our way we met many Europeans who brought their car / motorbike over from Europe. It was certainly an option for us but introduced the uncertainty of time/money what it takes to get the vehicle out of customs. Then an international insurance, especially against theft as otherwise you would have to pay import tax once the car is stolen. Furthermore, we heard of people being stopped by the police in Argentina and being charged for some “irregularities”. The fact that they had European number plates might have contributed to this. We experienced with a Brazilian registered car we never had any issues. Furthermore, we decided not to have the latest version of swanky car, as it could call a fair bit of attention depending on where you are. We looked at buying a new car, or old used car or rent a car. All options have their advantages and disadvantages. We opted for the renting option, not the cheapest but with some shopping around it is possible to secure a good deal. It is however, not usual that cars are taken abroad and the rental company needs to agree to this and have an international insurance on the car. What greatly helped us at all border crossings to have a declaration written and signed by the rental company stating that they agree us taking the car into the counties travelled. This declaration was then stamped and approved by all embassies in Brasilia. This paper is essential as we were not the registered owners of the car. Last but not least the Carta Verde, a mandatory 3rd party insurance for all cars travelling trough the Mercosul and Chile. This is easily obtained at the border (in our case Chuí, Brazil) and is relatively cheap (£80 for three months). In general we never had to use a jerry can as petrol stations are normally frequent in all counties. However, the region around El Calafate, El Chaltén and the Ruta 40 north of these places in Argentina is notoriously known for having fuel shortages. We have read blogs from 10 years ago reporting about the same problem. We are not sure of the rout cause but came to the conclusion that is made on purpose in order to maximise profits, selling the fuel at increased prices to desperate tourists. The way around it is to take enough fuel in jerry cans with you to get through the area without filling up. We had extra 20 litres which were not quite enough to travel north and we had to travel back to the Ruta 3 on the East Coast (see day 45). Insurances. As mentioned earlier, it is mandatory, at least for Mercosul registered cars, to have a 3rd party insurance when travelling through Mercosul countries. Furthermore, it is probably recommended to have a decent travel insurance in place. We tried to get an equipment insurance to cover for our photo and video equipment as well as the laptop and other gear. We shopped around, read blogs and came to the conclusion that unless you get an insurance for professional photographers, which is extremely expensive, all other insurances do not provide adequate cover or have loopholes in their policy to avoid compensation. The main point for discussion was always insurance cover for equipment in an unattended car. We decided not to have an equipment insurance and just take that extra bit of care and avoid creating opportunities for thieves.